Eduard Anatolyevich Khil was a well-acclaimed Russian baritone singer and a recipient of the People's Artist Award of the RSFSR. Eduard was well known in his country from his singing in the 1960s and later. He fell into obscurity with the fall of the Soviet Union. He is best known in the Anglosphere for his 1976 hit transliterated into English as "I am very glad, because I’m finally returning back home" (often called “Trololo”, “Trolololo”, “Trololololo”, or similar names) due to internet attention. Khil became famous as a singer in the Soviet Union, performing the songs "Loggers," "The Moonstone" and "Blue City," among others. He also performed "From Where the Motherland Begins," a song President Vladimir Putin has reprised in recent years. Khil has toured in over 80 countries and lived at Tolstoy House (Толстовский дом) in St. Petersburg. After his singing career faded in the early 1990s, Khil re-entered private life and worked in a cafe in Paris, singing cabaret. Since 1997, Khil has been involved with his son in a joint project with the rock group Prepinaki. For his 75th birthday, Khil was awarded the Order of Merit for the Fatherland, 4th Class in 2009 by Russia and in 2010 performed in St. Petersburg's Victory Day Parade. After retiring from a singing career, Khil slowly faded into obscurity in his later years. In 2010, Khil reclaimed the spotlight when he became the subject of the viral Trololo internet meme on YouTube, thanks to the spreading popularity of a single-serving website "Trololololololololololo.com" featuring a 1976 video of a vocalised version of the song, "I Am Glad I'm Finally Going Home". "Trololo Man" passed away June 4th, in the early hours of Monday morning in St. Petersburg, leaving behind a legacy spanning generations. Apparently, the 77-year-old had been hospitalized after having a stroke in early April, with doctors giving an uncertain prognosis. He passed away at 1:35 a.m. Monday, RIA-Novosti reported, citing a source at the Polenov Neurosurgical Institute where Khil had been hospitalized. 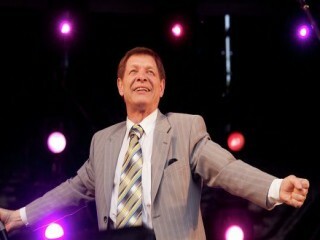 View the full website biography of Eduard Khil.